Managed Services from Bytecafe provide you with more reliable performance and more predictable expenses. That means you get more value from the technology you’ve already invested in, while actually reducing the total costs of IT problems and the resulting downtime. We provide a range of IT support, computer network support and computer repair in Indianapolis, Fishers, Carmel, Westfield, Lebanon, Zionsville, Cicero, Noblesville, Greenwood and Kokomo, Indiana. Wonder How Much to Budget for IT Support & Services? 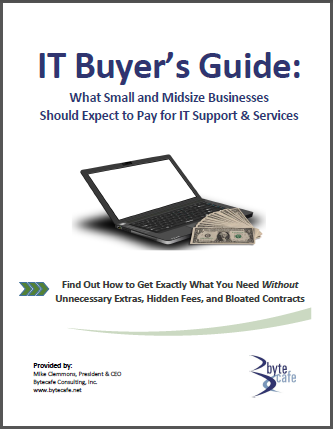 Download Our Free IT Buyer's Guide Today!